At Genesys, we believe every customer is entitled to a great customer experience through any communication channel. While self-service IVRs often are implemented as a way to keep costs down through call containment, self-service applications have more recently become a critical opportunity to create better customer experiences. 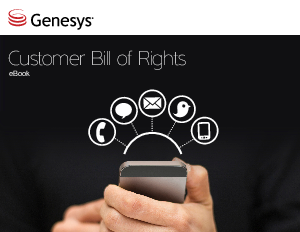 Download the Customer Bill of Rights eBook and let Genesys help you stand apart with an IVR experience your customers will actually rave about.